This is an interview I conducted with Hammer studio scream queen Veronica Carlson at the 2001 Memphis Film Festival. Of all the actors and actresses who appeared at the Memphis Film Festival, I had the hardest time interviewing Veronica Carlson. It wasn't that she wasn't open to talking, on the contrary, she was very warm and open to all the fans. The problem was that she was the only person who left me star-struck. Regular readers know that I love horror movies above all other genres. The horror films produced by Hammer studios are my favorite by far. Every time I was in her presence I opened my mouth and nothing but gibberish and drivel poured out. This interview took place over the four day run of the festival. There were many more things I wanted to ask, but my darn mouth couldn't form the words. I had my best luck with her on Friday night. I came up to her with my 14 and 3 year old daughters. As I started to introduce them she asked if they were my wife and daughter. Christy, the 14 year-old laughed and ran to tell my wife. That evening actor Jon Locke had asked if the girls were my grand-children and then William Windom asked if they were my daughter and granddaughter. My wife was looking at posters across the way. She looked at Ms. Carlson and I and shook her head. Through her laughter, Ms. Carlson said "Please tell her cheerio!" I guess that's a British way of saying "My Bad, sorry." "This may be the south, but I don't have a daughter by my own daughter." I said. This reminds me of the old joke: "If a couple from Alabama gets divorced are they still brother and sister?" Ms. Carlson laughed. "I love redneck jokes. Who is the comedian? You're a redneck if…Jeff Foxworthy. I love his jokes. One of the things a man learns as he gets older is to appreciate the beauty of a wider range of women. Veronica Carlson may not look like she did when Christopher Lee sank his fangs into her in "Dracula Has Risen From the Grave" but she is still a strikingly beautiful woman. Better yet, Ms. Carlson is witty, intelligent and multi-talented. Veronica Carlson: We were filming a reaction shot in 'Dracula' when Freddie (director Freddie Francis) held his hand up. "this is your focus point" Freddie said. We were filming my reaction to something that Christopher was to have said to me. Christopher came on the set. He had been filming all day in that 35 pound cape and those awful contact lenses. (Bloodshot Dracula contact lenses.) Chris stood there off screen and said that he would be my focal point. I was able to act with him even though he wasn't on camera. I was new. He put me at ease and helped me give a better performance. I was touched that an established star would take the time to do that for me. Christopher told me that when he was starting out he did a film with Gregory Peck. Mr. Peck did the same thing for him and he never forgot it. I told her that it was nice to hear because Gregory Peck is another actor I admire greatly. I asked about her painting. Ms. Carlson showed me several photographs of portraits she had painted. The portraits were very realistic, almost to the point of being photographic in detail. I was particularly impressed with her painting of two small girls in a rocking chair. They reminded me of my own daughters. RW: Peter Cushing painted also, didn't he? VC: He was quite the painter. A very accomplished artist and a dear sweet man. Ms. Carlson sketched a limited edition print of Christopher Lee and Peter Cushing as Dracula and Van Helsing. I mentioned that Anchor Bay was releasing "The Horror of Frankenstein" on DVD. VC: Oh I know! I'm so excited. They did a lengthy interview with me for the DVD. The conversation returned to her artwork. 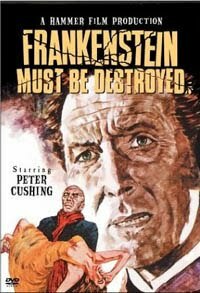 RW: Phil Hardy in "The Encyclopedia of Horror Movies" stated that "The Horror of Frankenstein" is generally considered the movie that ended Hammer's golden age of gothic horror films. What do you think? VC: I felt that Jimmy (director Jimmy Sangster) pushed to much toward comedy on "Frankenstein." I think Jimmy realized his mistake later on. RW: In your three Hammer films you worked with three of the genre's best directors. What was it like to work with Freddie Francis? VC: Freddie directed "Dracula Has Risen From the Grave." He was a brilliant cinematographer. He has won Oscars for his camera work. His movies had great pictures and lighting. As a director he was very gentle with me. He realized I was a new comer. RW: How about Terrence Fischer? He was considered the master director of Hammer? VC: They were all good. Terry directed "Frankenstein Must Be Destroyed." He sensed that I had more confidence as an actress. He gave me more rope. He would ask me how I felt about a scene. How my character would feel. I appreciated the way he treated me. He was sincerely interested in my input to my character. RW: Finally, what about Jimmy Sangster? VC: He was a very funny man. They were lighting a scene on "Horror of Frankenstein." It was a bedroom scene. They called for my stand-in to do the lighting. I was already in the bed. I said that I would stay because I was very comfortable. Jimmy ran over and jumped in with me. He pulled the covers up and grinned at me. We got a still of that taken. He was a delight to work with. Always making jokes. Of course, when the cameras were rolling he was very serious. VC: I told you, call me Veronica! RW: Veronica, thank you for taking your time to answer these clumsy questions. In hindsight, I wished I had asked her more about the inner workings of Hammer Studios. I had tons of questions, but it's hard to run your mouth when you have stars in your eyes!